CheckIt by Hillyard, provides a simple way to validate cleaning protocols and provide cleaning staff feedback with the goal of improving surface cleaning and disinfection outcomes. Use the Steril-Rite UV blacklight reactive disinfection marker to discreetly mark high-touch surfaces with invisible ink. Use on any hard non-porous washable surface not harmed by isopropyl alcohol. When the routine cleaning process is performed properly, the invisible ink will be wiped away. 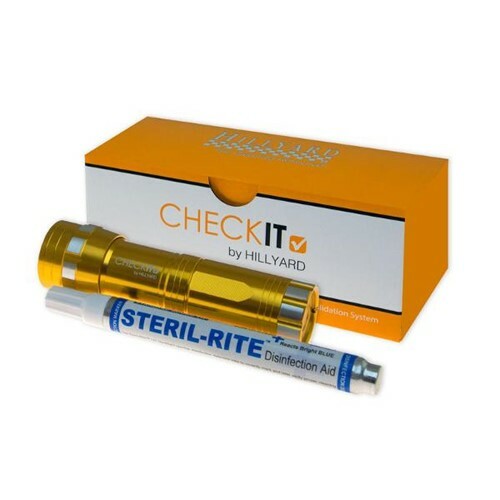 Use the Hillyard CHECKIT brand UV black light to confirm the surface has been cleaned. If cleaned properly, the mark is gone. If cleaned improperly, the mark appears under the ultra-violet light. Use the Hillyard Online QC App to track marking placements and results. Utilize the data to help train and take corrective action to improve outcomes. Ask your SSC Account Manager to provide access.